Question: What is the difference between a resource and a product? products - objects that have been created or produced for use. resources - a resource is something that can be used to make a product. 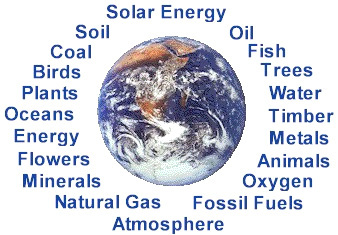 natural resources - a natural resource is found in nature (not made by humans). 1. View the slide show of images by clicking on the picture above. These images are all pictures of natural resources. 2. Print out Worksheet 1. On the worksheet list 10 products (items) that you can find in your classroom. 3. Think about what basic materials are needed to make these products. Where are these products found? 4. Fill out the worksheet by checking off which resources were needed to manufacture (make) each product. Mark this on Worksheet 1. 6. Think about the question "What is my role in the use of natural resources". Put your answer on the worksheet. Your answers may change over time! 7. Put your worksheet in the Science section of your binder. 7. Now watch the video below "Resources - Welcome to the Neighborhood." Homework - Print out Worksheet 2. Choose one room in your house and list 10 different products. 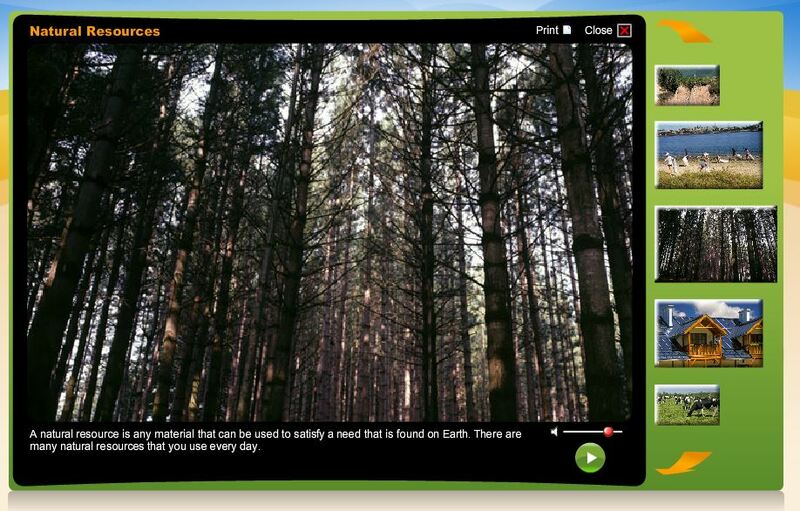 Decide which natural resource supplies the most materials to the products. Be ready to answer the question "What two natural resources provide the most important products found in the room you chose. Put your homework sheet in your binder. Question: What is the difference between renewable and non-renewable resources? renewable - can be used over and over again and replenish themselves. non-renewable - cannot make any more and will eventually run out. 1. Share the homework worksheet from last lesson. What room did you choose? What natural resources did you identify? Put the worksheet back in your binder. 2. 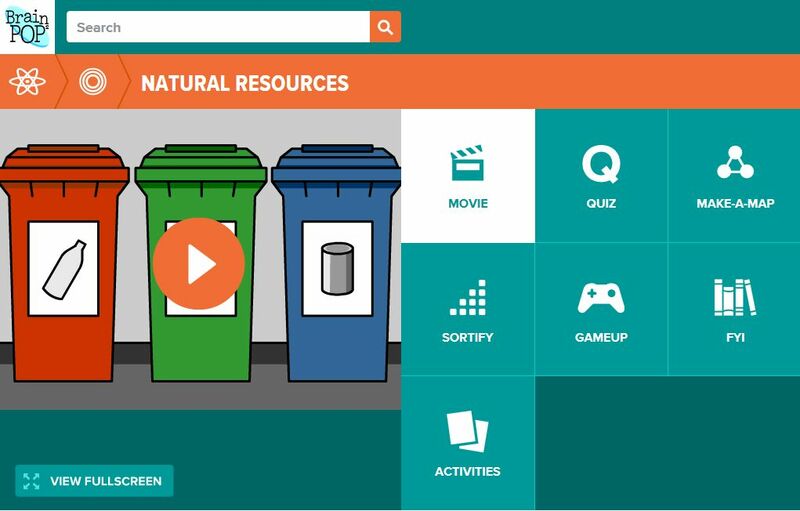 Watch the video "Natural Resources" on the Brainpop website. 3. When you have finished watching the Brainpop video go to the Quiz icon and complete it. Print out your score and put it in your binder. 4. Now go to the Activities icon and complete the Graphic Organizer. You can either fill it out online and print out the finished chart or print out the chart and finish it. Put each resource in the correct column with an idea for conservation in the right column. You should be able to list at least 8 resources. 5. Play the Sortify Game! 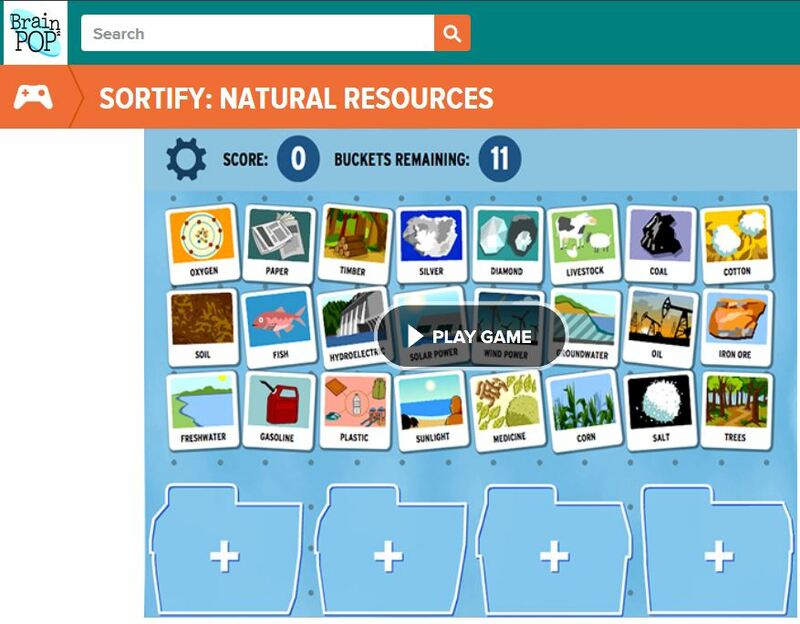 How many ways can you sort the resources? 6. If asked, write a paragraph answering the question "What is my role in the use of natural resources?" 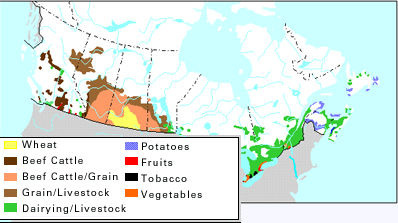 Question: Where and what natural resources are found in Canada? 1. Print the Resources in Canada worksheet. 2. Use the green Nelson Intermediate atlas, pages 20 - 29 to answer the questions on the worksheet. 3. Place thumbtacks or stickers on a large Canada wall map to indicate where resources are found.